This refers to the debate in Indian Parliament (Lok Sabha) about the “unrest in Kashmir” in which many Indian MP’s including National Conference President and Union Minister for new and renewable energy resources Farooq Abdullah also participated. As expected it looked more an exercise of rubbing salt on the wounds of Kashmiris rather than any meaningful debate and discourse. 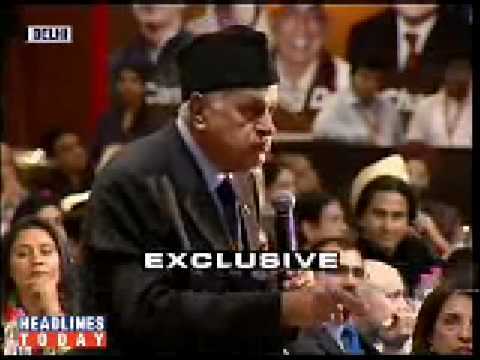 But the way Farooq Abdullah tried to prove himself more loyal any other member sitting there in parliament. There was no word of condemnation or sympathy for those people, which included kids and women as well, killed by CRPF and Police and other excesses perpetuated by them during this “unrest” by Farooq Abdullah. Instead he blamed media in Kashmir for “wrong reporting” and adding fire to fuel, it is ironic that a person claiming to represent Kashmiris speaking such language. Media in Kashmir is doing objective and fair reporting of events in most trying and testing times for which they should be lauded. From gagging, stopping circulation of newspapers and banning local channels, beating and threatening journalists and stopping them from doing their professional duties is what they get from the champions of democracy. Kashmiri journalists have given their lives for maintaining the sacredness of this noble work. His utterance that complete independence of Kashmir is not viable and would make Kashmir another Afghanistan shows his meek mentality. Independence of Kashmir is not only viable but the only solution to this dispute and Kashmiris are determined to get it. Kashmiris are peace loving people who have full faith in democratic principles and Kashmir was independent nation before 1585 AD and has recorded rich history which is more than 5000 years old, by saying after independence its situation will be like Afghanistan is sheer distortion of facts and jaundiced vision. Kashmir has been bestowed with so much of resources that not only Kashmir will prosper after independence but will be in position to give aid to poor countries in need of it. However, the people who run their politics by selling the interests and honour of their nations to enjoy perks and privileges of power can’t realize and accept this fact. There is no point in arguing about the rhetoric that whole Kashmir including Pakistan administrated Kashmir and Gilgit-Baltistan is an integral part of India, once out of power he will himself confront it, as everybody knows that it is an internationally recognized disputed territory whose fate is yet to be decided by its people. Every one knows that Farooq Abdullah is a person who blows hot and cold in same breath but at a time when entire Kashmiri nation is aghast over the killing of innocent people his comments shows his total disregard and disrespect to the sentiments of Kashmiris. Regarding BJP leader Murli Manohar Joshi’s remarks that autonomy is not viable and hence shouldn’t be given to Kashmiris is as Kashmiris are with begging bowl before Indian government to receive autonomy. No body here in Kashmir is anyway interested in autonomy in which even the Prime Minister can be herded to jail by a police constable on the instructions of Delhi. Kashmiris are fighting for complete independence with an aim to live honourably among the comity of nations with full membership of UNO, OIC, SAARC and other honourable world bodies. Amidst all this only sane voice which showed some respect for the sentiments of people of Kashmir was of Barrister Assaduddin Owaisi, Leader of All India Majlis-e-Ittehadul Muslimeen (AIMIM) and MP from Hyderabad, he voiced concern over the killings in valley at the hands of troops and offered condolences and paid tributes to the people killed. He cited many examples and lambasted government over the human rights violation in Kashmir and the severe difficulties people are facing due to curfews and other restrictions. He spoke in favour of releasing prisoners, revoking Public Safety Act and withdrawing troops from civilian areas but it was quite painful to see Farooq Abdullah confronting him over this. It was Farooq Abdullah’s duty to present these views expressed by Owaisi before parliament but he chose otherwise. “Mainstream” politicians in Kashmir have been swayed by power which made them so blind that they are not able to see the sufferings of people of Kashmir. Such people won’t be even owned by India at the end and once they outlive their utility they will be shown the gate. It is time for mainstream politicians to shun their respective political ideology and join the freedom struggle with full sincerity. That is the only way people will forgive them for their follies they committed with the Kashmiri nation time and time again.